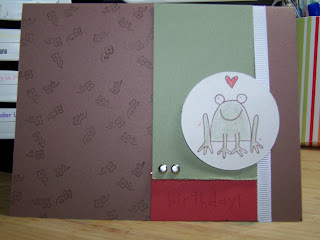 Every once in awhile I will go through the Idea Book & Catalog and see some cards I really like and want to make them. Well I have quite a few this time around that I really like in there. And sometimes you don't always have all the elements you need to make them. So I improvise. This card uses The set Unfrogettable and the Background Basics set. I replaced the ribbon with white grosgrain and voila you have my version.